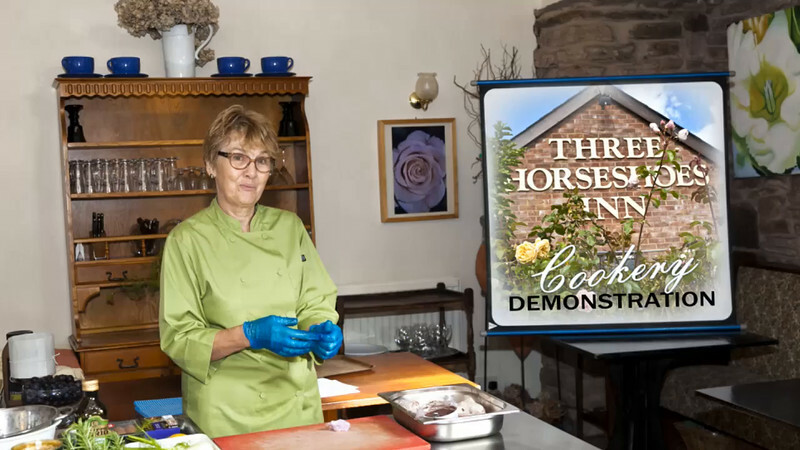 The Three Horseshoes Inn at Bromyard, Hereford,were pleased to welcome the Gloucestershire Farmers Wives Club to an autumn cookery demonstration. 30 ladies arrived in time for coffee and homemade lemon & ginger biscuits , before settling back and enjoying a Cookery Demonstration by Janet Whittall, Head Chef Steve Bailey and Pastry Chef Dominika Banach. They put together a Menu of dishes, including Gravad Lax & Mustard Sauce, Italian Chicken Cassoulet & Salmon Tart to which were added some Autumn Salad made from vegetables & leaves from their own garden. A Trio of Damson Desserts, Damson & Hazelnut cake, Damson Soufflé with Damson Ice Cream, showed how versatile the Humble Damson can be. Everyone had chance to wander around the garden, enjoying the Autumn Sunshine. All the dishes were served for lunch after the demonstration, everyone went home with a recipe leaflet, ready to try some of the recipes for themselves! Promotional video and photography by Nick Fowler & Tracy Wakelin.